Colors are very important for heroes! You can’t have a green aura with a red suit, right? And now for something entirely different. 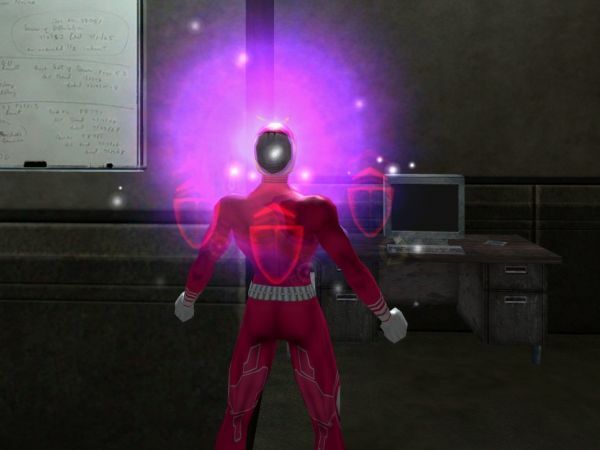 Â I haven’t written about the online superhero gameÂ City of Heroes in a long time, but it is still going strong. Â The question is, will it still be going strong once there is direct competition? Â The people who play a superhero game are not necessarily the same as those who play elves and dwarves (although I see some suspiciously elf-like heroes sometimes). But with the release of Champions Online, there will for the first time be another dedicated superhero MMORPG, and one developed using newer technology and learning from the experience of CoH. Â Learning very closely, actually, because the company that releases Champions Online is the same that originally created City of Heroes. They later sold CoH to NCSoft, a large Korean-American MMORPG company which had published and supported the game from the start. So how does CoH prepare to meet their doom the competition? In the long run, by promises of a third expansion. There are currently two games in one,Â City of Heroes andÂ City of Villains. Strangely, it is often the same people who play them both. Â (I don’t like villainy myself.) A third expansion will make it possible for villains to be redeemed, gradually, through a series of quests, while heroes may become vigilantes and eventually go bad. Â It will also add large new areas in another imaginary world where the heroes of Paragon City have become tyrants, and the villains freedom fighters. This is still some way off though, and in the meantime there is Issue 16: Power Spectrum. Â “Issue” is their name for the free expansions that are added to the game, typically three times a year, although not necessarily exactly every four mounts. Â Some are larger and some are smaller. This one is small in the sense that it does not include new areas or radically new powersets. Instead it changes how the game works, in a number of ways. The most obvious, if you visit the test server, is the colors. Â Players can now modify the colors of all powers that have a visible effect. Â Most powers have, so there are a lot of interesting colors to see. Â Originally the color was hard-coded into each powerset, so it took a lot of programming to make them available to the players. Â But the result may well be worth it. Â The fact is that most people who come to the game with a concept of a superhero already in their head, also has color as an important part of the concept. Â For instance, my Lightwielder characters from the (still unfinished) books are typical Defenders in City of Heroes, but the powerset that best corresponds to them is “Dark Miasma”. Not good! Â Now, with Power Spectrum, I can change those powers to bright white, as they should be. Â Your hero may vary. While this is the most visible change, it is not the only one. The project of “power proliferation” continues, with powers that have formerly only been available to heroes becoming adapted to villains and the other way around, and some powers becoming available to more archetypes than before. Â For instance, tankers and scrappers can now have an energy aura that absorbs attacks, something only available to villains before. Â On the other side, villain dominators can now have Earth Assault, which is related to but not quite the same as Earth Control for Controller heroes. Perhaps the deepest change however is not very visible. It is the way teaming works when heroes (or villains) are of different levels. Â Levels play a defining role in all MMORPGs. Â To go up in levels is the most important thing for many players, and it is not unusual to park a hero once it has reached the maximum level and start over with another. Â But the usual approach means you move through the game world in a very defined way: Â You start in the newbie zone of Atlas Park or (more rarely) Galaxy City, then move to Kings Row or The Hollows, then Steel Canyon or Skyway City, then Talos Island or Independence Port, then Brickstown or Founders Falls, then Peregrine Island, the final zone where the portals to other worlds are. From the very start, it has been possible for a higher level hero to sidekick a lower. The sidekick operates as if 1 level lower than the mentor, but has only the powers available at his real level. The powers are boosted to the higher level, though.Â Also very early came the concept of exemplaring, or reverse sidekicking, where the Â higher-level hero fights on the lower level of his sidekick, but retains the enhancements to his powers, at least within certain limits, so is somewhat better than he originally was at that level. Â The hero that is exemplared down does not get experience points, however, instead getting double influence points (the currency of the game). This has changed. Â Now, the team leader or owner of the current mission sets the level for all members of the team. Â Lower-level characters are automatically sidekicked, and you can have as many sidekicks as the team limit allows. Â (Still limited to 8 characters, not counting pets.) Conversely, higher-level heroes are automatically exemplared down to the level of the team leader / mission owner. Â However, they now get xp as if they were fighting enemies their own level. Â So if you would get 1000 xp for fighting a minion, you will still get 1000 xp even if it is only worth 100 to those who are naturally at that level. Â This will encourage people to return to lower-level zones and help teams of younger, weaker heroes. Â It is in fact possible to level all the way to 50 without ever leaving the newbie zones, if you always team with newbies. Â Not a good idea, probably, unless you are my signature hero, The Eternal Newbie. Â ^_^ Â But it is nice to be able to visit the lower zones again occasionally without having to create a new character.